Ah, summer. Or, as it's sometimes known, zucchini season. If you were one of those brave souls that planted zucchini this year, it's about to start exploding. Or perhaps where you live, it's already mid-explosion! It's time to start finding ways to use all that produce. Fresh zucchini is great when grilled with a bit of olive oil and garlic salt, or sliced in pasta salads, or eaten raw with hummus or salsa. For these uses, pick zucchini (also known as courgettes) when they are still small, less than eight inches long. The following Pineapple Zucchini Quick Bread recipe makes two loaves, so there's plenty for payback if someone you know is sharing their zucchini largess with you. Or you can freeze a loaf, covering it in plastic wrap and then a layer or foil. I recently noticed that due to a store sale and a coupon, I could get pineapple chunks for half the unit cost of crushed pineapple. I bought the chunks (six cans — the limit) and, as needed, just give them a whirl in the food processor so I can use them in recipes. Preheat oven to 350 degrees. Mix wet ingredients together in a large bowl. Sift together dry ingredients then add to wet mixture and stir just until combined. Stir in optional nuts and/or raisins. Pour into two greased loaf pans and bake for one hour, or until a toothpick inserted into the center comes out clean. Preheat oven to 425 degrees and prepare 10 muffin cups. In a medium bowl, beat eggs lightly and stir in milk and oil. Combine dry ingredients and stir in to egg mixture until flour is just moistened. Gently fold in zucchini and basil. Fill muffin cups ¾ full and top with cheese. Bake 25-30 minutes or until golden brown. Makes ten muffins. For either recipe, you can substitute up to half the flour with whole wheat flour. For the first recipe (the bread), I also have a note that 1/2 cup of applesauce can be substituted for half the oil, but I haven't tried this lighter variation. What do you do with all the extra zucchini in your garden? 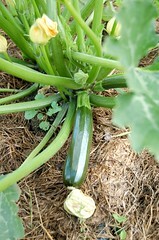 Photo of zucchini plant by Leeks ‘n' Bounds. 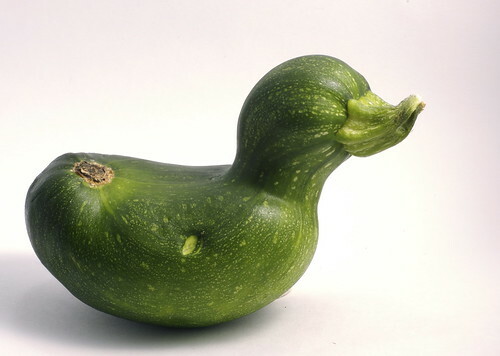 Photo of zucchini duck by Alex Gee. There are 41 reader responses to "Gardening Basics: What to Do with All That Extra Zucchini". Ooh, that zucchini-basil muffin recipe looks delicious! A good way to use my fresh basil, too. My favorite way to make zucchini is to cut it into chunks, mix it with other vegetables (onions, eggplant, mushrooms, garlic), marinade it in olive oil and balsamic vinegar, and roast. There are also some good stuffed-zucchini recipes out there, which are good for very large zucchini. Slice kielbasa or Italian or other firm sausage and brown, blotting up excess grease from the skillet. Add shredded zucchini and saute, adding onion and garlic, then chopped fresh or canned tomatoes (omit the juice) near the end. Squeeze a bit of lemon over, season with salt and pepper, and sprinkle with Parmesan. Serve over rice or with bread. My grandmother uses her extra ones or the ones that are too large to eat to make Zucchini Relish. Phenomenal. I can’t wait to try the muffins! I’ve had sweet zucchini and carrot muffins, but I’ve never tried a savory recipe. We’ll be having zucchini and summer squash tonight in my Summer Veggie Quesadillas. So J.D., do you like the quick bread too? Or just the muffins? I would be so surprised if you didn’t like zucchini bread…even as a zucchini-hating kid, I liked it in bread. Thanks for the recipes and the tip on what size to pick the zucchini. It’s my first year of growing them, and one’s the right size now. I highly recommend them! Will definately have to try that pineapple quick bread. I’m not gardening this year, but I belong to a CSA and this week our share (for 2 people) included 8 summer squash — and we still had 2 left from last week! – stuffed zukes: slice in half lengthwise, scoop out the middle, saute with other vegs and maybe some rice, add some cheese and/or egg to hold it all together, put back in the zuke boats and bake ’til done, I dunno, maybe 30 mins? – use in quiche, strata, frittatas, omelettes, etc. 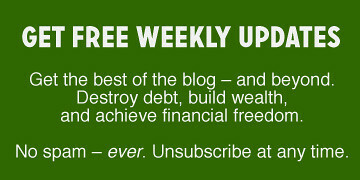 – curried zucchini soup is good, there’s lots of recipes for this on the web. I went camping last night and threw some crooked neck squash into my tin foil dinner. It added some really good flavor. One of my clients gave me two huge zucchinis this week. One of my kids made a delicious curry out of one of them, served over rice. Free dinner fresh out of the garden. Very enjoyable. I have been counting on relying on Farmgirl Susan’s method of blanched and frozen slices. She says they reconstitute fine, not like mush as she was expecting. And many commenters say that you can also freeze grated/shredded zucchini for baking, as well. I am always a tiny bit regretful about freezing as preservation, as it relies on electricity and is therefore somewhat risky (our power goes out sometimes) and costs money, but I’m not equipped to can everything. Yet. We eat them when they are still very small, chopped up in a salad. And we fry the flowers, so we don’t really get that many zucchini. Really, we are growing them for the flowers. We’ve had to cut out some bugs from the stems. Last year we had a plant that had rooted each time the stem touched the ground, so it stayed alive even though the stem was full of bugs. I’m going to try that muffin recipe, so I’ll have to let a few get big. I have a recipe for Zucchini Chocolate Chip cookies that is delicious. My children don’t care for zucchini, but they will eat those cookies! Very moist. Makes me wish I could have a garden here! Zucchini Pancakes – YUM. Shredded zucchini, bread crumbs, egg, parmesan cheese. Mix. Drop in skillet like pancake. In general, they never get out of the kitchen – hubby and I stand over the skillet and eat them as they come out! My mom found that she could shred the zucchini, measure it out, and put it in small freezer bags in portions just big enough to make a loaf of zucchini bread. All year, long, she could pull out a bag and mix up some fresh zucchini bread. We all loved it. One of my favorites is foil packets with slices of summer squash, zucchini, and fish (like red snapper) with spicy brown mustard and cooked up in the broiler or on the grill. Delish. When you reach the point where you can’t bear the thought of eating one more zucch’, you can donate them to a food bank. Let one squash grow until it’s ridiculously huge. Cut it in half lengthwise. Scoop out the flesh, leaving a half-inch or inch-wide “hull” for a “boat.” Reserve the flesh for specialties like zucchini bread, muffins, and pancakes. Wash and slice up a bunch of smaller zucchs. Chop up an onion and brown it in some olive oil. After it’s starting to carmelize, add some minced garlic, to taste. (I like lots!) Stir around till the garlic is softened, and then dump the onion & garlic out of the pan onto a plate. Put some hamburger or ground lamb (or a mixture) into the pan and brown the meat. Pour off any liquid or fat. Season the meat with some ground cinnamon and herbs to your taste, such as marjoram, basil, thyme, summer savory…whatever. Season with salt and pepper as desired. Add cumin if desired (gives a slight curried flavor). Cut up several nice tomatoes. Off heat, add this to the meat along with the onions & garlic. Stir together. Stuff the zucchini boats with this mixture. Top each boat with some grated or shredded cheese and bread crumbs. Heat in the oven till the cheese melts and the bread crumbs start to brown. Great fun food. Awesome leftovers. Try this recipe from Kim O’Donnel of the Washington post. It’s “Zukeamole,” a dip that closely resembles guacamole in texture, but not in fat! my mom would fry it, but mostly use it in baking. at the end of our run with zucchini (ie when everyone had enough) she would grate it and blanche it in hot water, then freeze it for use later in the winter. our family is on a gluten/wheat free diet, so when we were kids, the zucchini would provide much needed moisture and fibre to some of the goodies/ cakes/ cookies etc that my mom made. I love the duck. Zucchini comedy seems to abound across the country at this time of year. Best of luck with all of yours. For some additional green squash recipes and humor you might enjoy the link below. Enjoy the weekend. Part of your problem is that you’re eating the zucchini instead of eating the flowers! Instead, try making a batter of flour, baking powder, basil and Parmesan cheese. Add in a couple eggs and a little water until smooth like pancake batter. Heat 1/2 inch of oil in a large heavy skillet over medium-high heat. Dip the flowers in the batter and lay them carefully in the oil. Fry until golden brown, turn them over and fry the other side. Drain them on paper towels. This is an old Italian delicacy. Any squash flowers work: pumpkin, summer, winter, they’re all delicious! I like to put shredded zucchini in all of my baked goods, including brownies. I am not a fan of their flavor, but I don’t taste it in the baked goods, so it’s not a problem. I use a microplane so there are no big pieces. Most of the time it works the same as the applesauce for oil substitute. Thanks for the new recipes! I got an idea, get a big box and fill it full of them, then go to your neighbors house when they are not looking put it on there doorstep and ring the bell and run! Or you could put it in there car. I planted three of them! We have made jam, bread, cake and more with them. To get some ideas just go to recipezaar and type in an ingredient search for zuchinni, then select the highest rated recipes. There is thousands of ideas even an apple cobbler recipe that uses zuchinni and you can never tell it is not apples. My wife makes some kind of chocolate zucchini bread ( or something) and it’s pretty good. I forget exactly what it is. Fried zucchini is a good app as well. I make “Pinezapple” from extra zucchini. Peel and seed the zukes. This is great with those that have gotten too large for anything. Then use a food processor to “grate” into consistency of crushed pineapple bits. Fill sterilized wide-mouth jars with the grated zucchini and fill with pineapple juice. Process under pressure at 15# for 45 minutes. This tastes just like crushed pineapple whether fresh out of the jar or in baking! Thus my name for it – Pinezapple! The longer you keep this – the better the flavor. I’ve kept it for up to 2 years. The only difference in this and crushed pineapple is a slight difference in color. I have to admit J.D., I’m not a big fan of the Zucchini as well. My parents used to have LOADS of it in the garden and it just doesn’t seem like it would taste good in anything, I’ll have to pass these recipes along to my parents! Also on a gluten-free diet, but I make chocolate zucchini bread using gluten-free flour. I also like to make lasagna using zucchini sliced thin and steamed in place of noodles. We don’t have a garden, but I always grate any extra zucchinis from friends and put in the freezer in 2-cup packages as was suggested earlier. And, I think they are wonderful in stir fry. Use baby zucchini for stir fry, providing a flavorful dish and helping to eliminate a bumper crop of monster zucchini as you can use quite a few babies in one stir fry. My mom always planted FAR too many zucchini plants, in case some didn’t thrive – but of course they always did. Our neighbor made some amazing zucchini pickles, and I don’t even like them. Cafe Castagna, on Hawthorne, served them on the side of a burger once and I recognized them instantly. Back to my mom’s bumper crop: she pureed them and used them as the liquid in whole-wheat waffles. Yeah, this was the 70s and she was just a LITTLE bit into the healthy food craze! My dad refused to eat these brown waffles with green edges, but to my mind they were far preferable to a plate-ful of sauteed zucchini. Chop up small or grate and add to spaghetti sauce or lasagne. Delish and my kids even eat it. I was going to post about this, as well! I think it was a zucchini chocolate-chip bread / cake that was moist and amazingly yummy. No recipe on hand, and no time to look it up, though – but I bet you could Google it. I also love to stir fry chicken in olive oil, garlic, and ginger, then stir fry in zucchini and onions. Add a box of olive oil and garlic couscous (cooked). A bit of cayenne pepper and soy sauce and you have yourself a one pan meal. Delish. Last but not least stuffed zucchini. Core out the center of the zucchini (you need to let them get big for this) and stuff it with some of your favorite fillings. I like ground meat with onions, tomato sauce, minute rice, and spices. Bake it in a bed of tomato sauce. If you get one that is really really wide, slice it so it looks like burger patties about 3/4″ thick and then grill them. Put some cheese on them and serve them like a real hamburger. They are the best things I’ve ever ate and the only reason I’m trying to grow my own zucchini, but none of mine have gotten big enough yet. The zucchini basil summer muffins are INCREDIBLE. I’m eating one now. Thank you for the recipe! I had to change it a bit, though, as I pulled the muffins out of the oven after only 12 minutes because the cheese was getting quite dark. The muffins were cooked through at that time, so all is well. If you get one that is really really wide, slice it so it looks like burger patties about 3/4â€³ thick and then grill them. Put some cheese on them and serve them like a real hamburger. They are the best things I’ve ever ate and the only reason I’m trying to grow my own zucchini, but none of mine have gotten big enough yet.